These matched side chairs have remnants of their original red paint. 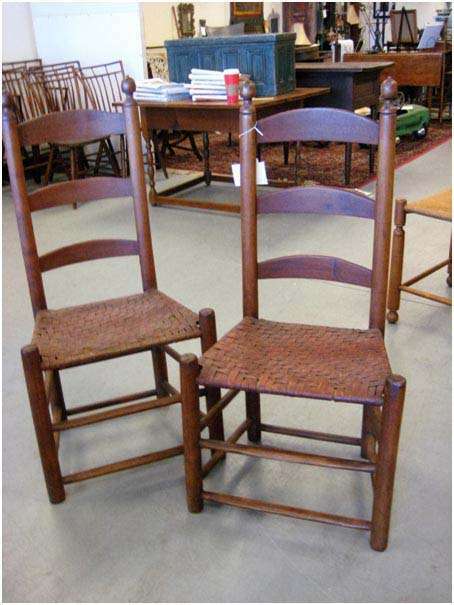 Their design and construction are similar to the chairs of Eastern North Carolina from the mid to late 18th century. At the 2011 exhibit, “Have a Seat,” at the J. Y. Joyner Library at East Carolina State, the accompanying catalog by Mark Wenger shows a similar form and similar finial turnings. Not knowing the maker, Wenger refers to them as being Roanoke River Basin School.